This volume outlines a theory of translation, set within the framework of Peircean semiotics, which challenges the linguistic bias in translation studies by proposing a semiotic theory that accounts for all instances of translation, not only interlinguistic translation. In particular, the volume explores cases of translation which does not include language at all. The book begins by examining different conceptualizations of translation to highlight how linguistic bias in translation studies and semiotics has informed these fields and their development. The volume then outlines a complexity theory of translation based on semiotics which incorporates process philosophy, semiotics, and translation theory. It posits that translation is the complex systemic process underlying semiosis, the result of which produces semiotic forms. 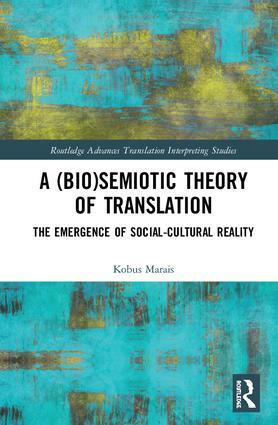 The book concludes by looking at the implications of this conceptualization of translation on social-cultural emergence theory through an interdisciplinary lens, integrating perspectives from semiotics, social semiotics, and development studies. Paving the way for scholars to analyze translational aspects of all semiotic phenomena, this volume is essential reading for graduate students and researchers in translation studies, semiotics, multimodal studies, cultural studies, and development studies. Kobus Marais is interested in understanding the emergence of society and culture from a material substrate. He specializes in semiotics with a focus on complexity thinking and the relationship between translation and development. His publications include Translation theory and development studies: A complexity theory approach and, co-edited with Ilse Feinauer, Translation studies beyond the postcolony.